Who cares about Rey, Finn, Luke, Leia, Poe, Kylo, BB-8 or Snoke? We love Porgs and we need Porgs. After the release of The Last Jedi trailer on Monday the Internet is having what many are calling a Porg-fever. While the Star Wars: The Last Jedi trailer didn’t give much screen time to fan-favorite creatures, the Porgs, nor did they get a place in the poster, fans made sure they were included in these Porg-versions of the poster and supercut of the trailer. The Star Wars universe is packed with creatures – some of them loved by fans, others that should be left in oblivion – and Porgs are some of the latest additions to this ever-expanding universe. Porgs will appear for the first time in Star Wars: The Last Jedi and they have already become quite popular among fans, even if they have just appeared for a few seconds in the teaser reel and the trailer. And while many Star Wars fans analyze the content of the trailer and the poster, others have taken their editing skills to give Porgs a prominent place in the poster and a short version of the trailer. Porgs are a sea bird species native to the planet Ahch-To, where Luke Skywalker made his exile. Given that the first teaser and the new trailer have, for the most part, featured scenes from Rey’s training in Ahch-To, it’s not surprising that fans were expecting to see more Porgs in the new trailer. Sadly, they didn’t get much screen time, only briefly appearing next to Chewbacca in the Millennium Falcon. However, a YouTube user made a short super-cut for Porg-fans who wanted more of these creatures on the trailer. Not long after the release of the poster (prior to the debut of the trailer), some fans realized it didn’t feature any Porgs, so they took to Photoshop to fix the problem. The result: a bunch of posters with Porgs here and there. Some of there are subtle, just by adding a small Porg next to the characters in the poster; others are more in-your-face, with the creatures taking the place of the characters entirely. You can check some of these pieces below. The popularity of Porgs has been such that they have already been compared to the Ewoks – who, although of big help during the Battle of Endor, are seen by many as a marketing ploy and a way of catching the attention of younger viewers. Porgs will reportedly share some interesting moments with characters like Chewbacca and R2D2, with director Rian Johnson assuring they will have their place in the film. What we can be sure of is that, as the release date of The Last Jedi approaches, Porg-fever will increase. Star Wars: Episode VII – The Last Jedi writer and director, Rian Johnson, promises that the Porgs will have a role to play in the story of the film. Unless they’ve been living under a rock for the last several months too, every Star Wars fan in the world has heard about the Porgs by now. The adorable, penguin-esque new additions to the cinematic universe were considered instant hits by most fans of the franchise, who have not only fallen in love with the look of the creatures but how they represent the continued world-building on display in The Last Jedi. It doesn’t come as much of a surprise either, that all Porg-related toys and merchandise have become hot sellers since they first went on sale a few months ago. However, there has been some criticism from a division of Star Wars fans that Porgs and some of the other notable creatures included in The Last Jediare either nothing more than marketing decisions by Johnson and Disney, or examples of the film going too far into cute and cuddly territory. Although, the second trailer for The Last Jedi appeared to altogether disprove those latter concerns. “I was like, ‘Oh, this is part of the island, we need to find the Star Wars version of this. And then just story-wise — not that they play a big part in the story — but I knew I wanted to find any source of comic relief I could on the island. And so they were very useful in terms of that. After several months of new facts about the Porgs and images of them being released by Disney and Lucasfilm, fans got to see the Porgs on display for the first real time in The Last Jedi trailer. To say that the creatures just managed to garner even more fans because of it too – would be an understatement, with fans going on to create dozens of Porg-centric Last Jedi parody posters following the trailer’s premiere. 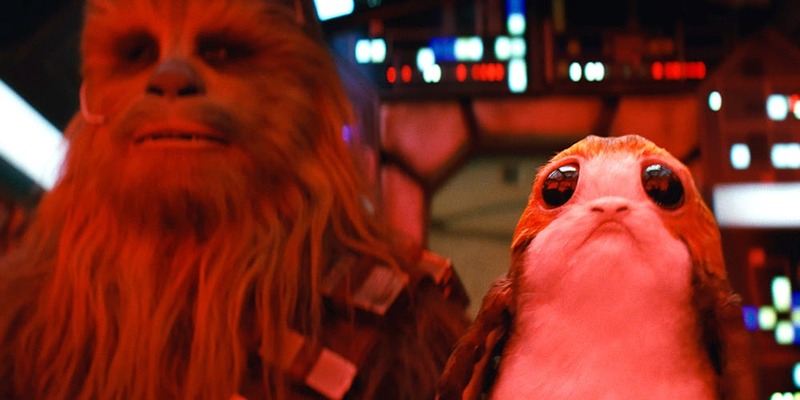 Now, whether or not the Porgs are actually used well in The Last Jedi, remains to be seen, and it’s entirely possible the adorable creatures could be one of the biggest problems fans have with the film in the long run. At the same time, however, the Porgs are an example of how Rian Johnson and Lucasfilm are trying to be more experimental with their Star Wars world-building techniques in The Last Jedi, which was something many fans called for after The Force Awakens was released. All of that will, no doubt, be points of discussion amongst fans when The Last Jedi hits theaters later this December, though, and for the time being, the Porgs are currently shaping up to be one of the most unique and lovable things about the new film. Star Wars: The Last Jedi may be set to move a lot of Porg merchandise, but BB-8 isn’t buying. For diehard Star Wars fans, the inclusion of Porgs in The Last Jedi has been known for some time. Residents of Ahch-To, where Luke has been in self-imposed exile, the tiny critters are an adorable addition to the animal kingdom of the galaxy far, far away. Of course, they’ll also make for some great toys and mascots. And with the release of the new trailer for The Last Jedi, general audiences now have Porg fever. Given the Jar Jar Binks debacle, fans are still worried whenever a cute character arrives in a Star Wars film. But droids have long held a similar function in the universe, acting as quirky characters while moving toys in the real world. BB-8 even upped the ante, offering Star Wars its most adorable and marketable character yet while still fitting nicely into the narrative. But now that the Porgs have arrived, could they supplant BB-8 on his exalted perch? The Late Show with Stephen Colbert opened its show last night with an imagining of how BB-8 is dealing with Porg-mania, and the results aren’t pretty. In fact, it looks like the little droid is in need of a friend. Lucky for BB-8, the Porgs won’t be the only new addition to the Star Warsuniverse. A variety of creatures great and small will occupy Ahch-To. And then there’s BB-9E, the all-black variation on the soccer ball droid. Will the two be friends or enemies? Only time will tell. If you want really to conquer a girl, forget about flowers, bears and candies. Just give her a Porg as gift. The Last Porg… Oops, The Last Jedi hits theaters on December 15th.